I have a giant stack of magazines that have been piling up, as magazines are wont to do (another item on my lingering to-do list: cancel all magazine subscriptions), and this week I've finally started whittling away at it. 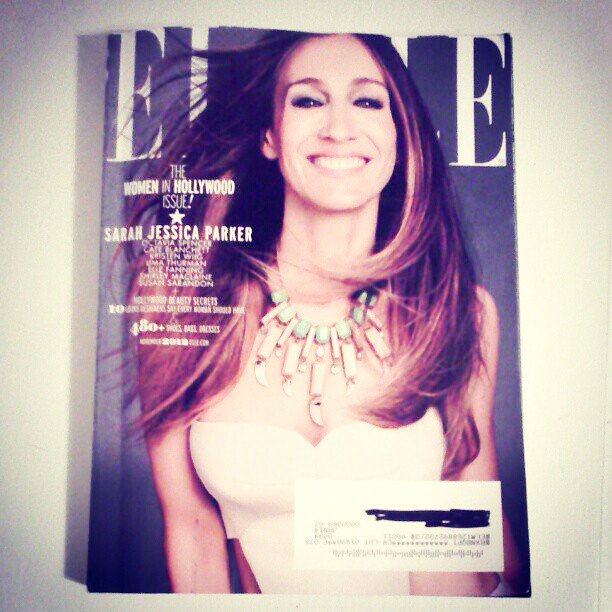 I subscribed to Elle in the first place because I liked the cover stories, but the rest of it is fashion and ads, ads and fashion, and fashion ads, which I care zero percent about, so it's ended up being kind of a waste of my money - until Sarah Jessica Parker showed up in my mailbox. I love SJP, so I was instantly drawn to the cover. And then I found out it was the Women in Hollywood issue, which meant that it was a treasure trove of interviews, which is the reason I started reading the magazine in the first place! Major score. There were interviews with everyone from SJP to Emma Watson to Uma Thurman and more. They're short and sweet, and they made me tear up. I would have cried, but I was in a public place while I was reading it. And just to be clear: there's nothing sad about this issue. It's just that lately, I have been on the verge of tears a lot. Not sad tears, necessarily, but inspired tears, or tired tears, or what-the-eff-am-I-doing-with-my-life-right-now tears. They rarely spill over and become actual crying, but whenever I feel a sense of togetherness or inspiration, or someone says something that strikes a chord in me and makes me feel a little more understood and a little less alone, the tears, they start a-wellin'. They're twenties angst tears, y'all. Anyway, the interviews were full of all the above. I read through the end of the magazine (because the actual "Women in Hollywood" part doesn't start until friggin' page 355) like I was reading a suspenseful thriller novel. I even dog-eared a page, an action I usually reserve for meaningful parts of books I'm enjoying. It was hard not to feel a little inadequate as I read through story after story of how hard these amazing women have worked to get to this point in their lives. But it was also motivating; I finished reading and hugged it to my chest and thought for awhile (I was lounging alone on a couch at this point, so it wasn't as dramatic as it sounds) about how sometimes luck and timing play a role in someone's success, but 99.9% of the time, if you aren't working hard in the first place, those two factors will never find you. The harder you work, the luckier you get. "I think the struggle is to live an authentic life....Often, being comfortable and courting the illusion of safety cannot coexist with being authentically who you are. Anytime I have drastically changed my life - which has happened a number of times and, I hope, will happen many more - it's always been a mixture of terror and exhilaration and discovery. But I believe that being surprised and being somewhere that's uncomfortable because it's unknown is really one of the main rules to live by." That quote really drove home the point that had these women prioritized being comfortable instead of learning and excelling and growing, they would not be where they are today. It's essential to step - no, dive, jump, boogie - out of your comfort zone, because you absolutely cannot do meaningful work if that's not a part of your process. 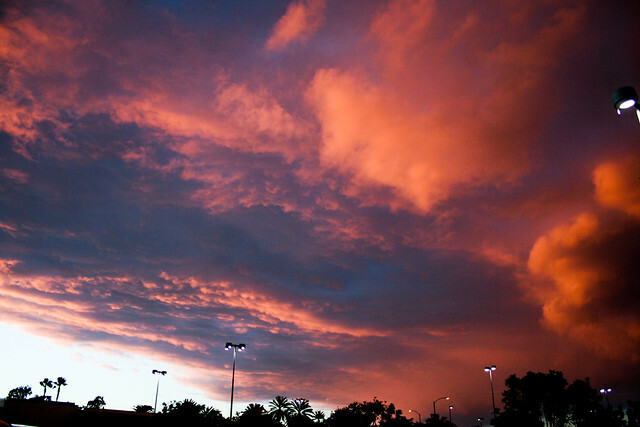 I leave you with a picture of an epic LA sunset that happened this weekend.